And I myself haven't been feeling that good lately... This and many other things that have been on my mind lately kind of stalled my creativity and desire to try new things. I am not talking about blogging as it is right now. I love blogging and it's a huge part of my life but I just feel like I have nothing to say. It's been boring here, I know. I think I might've hit an emotional wall (time to get a quick fix with a half-a-pound bowl of vanilla bean ice-cream...). But seriously, do any of you really get inspired by my weekly food waste?!! You don't HAVE to bubble. I enjoy what I read on your blog. Just tell us about your frustrations if that is what is on your mind. You will bubble again. 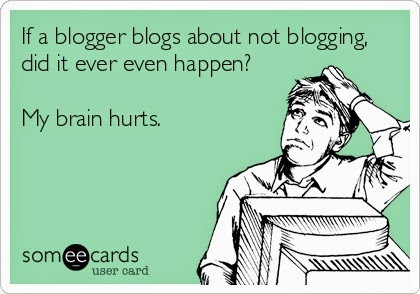 I can totally relate because I am also in a blogging slump. I don't have much to say or the energy to say it. However, I figure this too will pass. Hope your mother-in-law continues to improve. I hope it will... And thank you. I'm sorry that life is so stressful right now. You have a lot on your plate right now, so please don't worry about blogging. Prayers for a speedy recovery for your mil, and I hope that your mom continues to do well. Hope that you feel better soon too. I enjoy your blog because you give a different perspective to being frugal. I like when you share recipes from your homeland. I am so sorry about your mil - praying for her and you and the family. It is hard. But God is good. I know exactly how you feel right now. My Nana's sister (my great-aunt) has been in the hospital for about a week - they do not think she will survive much longer. She is ready - ready to see the Lord. I feel helpless. Scattered brained. But then I remember that God is in control. She will be with Him...much better. Still hard. I love your food waste posts - it has helped me so much because it reminds me to not waste food and when I am throwing away something...you always pop into my head. lol I think Lena wouldn't be doing this. Haha. You are creative and inspiring. I love your blog. Don't feel like you have to post right now. Take your time to process. To pray. To be with family. To relax. And I'm sorry about your great-aunt!! Hi Lena. First of all I want to say that I am so sorry to hear about your Mother-In-Law having to go to the hospital. I will be keeping all of you in my prayers. I also want to tell you that I completely understand how you feel about the blogging. Now that I am doing it myself (and I only got started very recently) I have been sitting here wondering how you guys who have blogged for years manage to come up with so many topics and things to write about. But I want you to know that you do a SUPER job with your blog. I eat up every post you write whether it is a project you are working on, a recipe you share, your menu plan, your food waste (I actually am interested in the food waste because it makes me more conscious of what is sitting in my fridge waiting to be used up), your grocery shopping trip- those kind of every day things are what makes your blog so enjoyable and easy to relate to. You are an everyday mom and wife who deals with the same tasks, challenges and thoughts that most women go through. Oh, thank you for your kind words, Dawn!! Thank you for your support. I hear ya. I love to blog and be creative with my writing but sometimes, I bore me. I think the best thing is just to push through it. Because I have tried to stop writing in the past and then I got really grumpy and depressed. Its good to have an outlet even if you bore yourself. And trust me, just reading about someone else's life helps. Life has ruts and its good to know that we all deal with them. And hugs to you MIL! Thank you for your support, Elise. I have found to just go along with it. Life isn't always exciting or worth mentioning some days. And that's ok. I personally like your food-related posts or decoration/DIY ones. I love your blog, None of us can post earth shattering news each day, nor wonderfuly creative creations. Old moldy food, piles of laundry, messy cabinets, is something we all deal with, it's nice to take a peek in others world who deal with the same thing as the rest of us. Ha I too am really have troouble keeping my blog up, has a whole lot to do with life in general!! Well, I'm glad you are enjoying my moldy food posts, Debby ;) Just kidding! Personally I enjoy everything you write about. You're not alone in feeling the way you do - I've taken breaks before and then have come back more inspired. I don't think it's possible to feel inspired everyday. I call taking a break "filling the well" - sometimes the well goes dry and you have to give it time to get filled back up again, with thoughts, ideas, plans, news, old memories... My ways of refilling the well? Reading, riding my bike, a movie binge, going for a long energetic walk, time to myself....I know that is way more difficult for you because you have 2 little boys but try to carve out some time for yourself (take a loooooooong bath!) HUGS!! Life flows and ebbs. Every day, week or even year is not exciting, but all are worth mentioning. I have found when the doldrums hit my best defense is to create some kind of odd personal challenge. It might be as simple as volunteering each week, reading a book each week, weekly refashioning of some existing clothing, or my current no food shopping for a month challenge. (Since this moth is ending today my next challenge is to reupholster a piece of furniture each week in May. (Huge fabric store went out of business so I have tons of fabric right now) There is something exciting about "winning" even though I am only competing against myself. Your blog must be just fine as it is since I have it set in my favorites and look at it each morning! I mean after all I am always in the process of a good challenge and I read it daily! That's a great idea! I need to think of a personal challenge for May. Thank you for this awesome idea, Anne! Hi Lena, it has been a long time since I commented on your blog, but I have been reading. I am so sorry to hear about your MIL - hoping for her to get better soon. You have been through a number of roller coasters this past year with your mother's diagnosis, your husband's job and now your MIL - so cut yourself some slack, girl!! We are very happy to hear YOUR story on your blog, so write whatever comes to mind...or not.....just don't shut down your blog!! I love to read about your life - your experiences growing up in a different country, your life here, your family, your finances, how you make choices to suit your circumstances...everything that makes YOU uniquely YOU! Hey, glad to see you back, my friend :) And thank you for your support. First of all, I am praying for your MIL's return to health! It's a shame you feel burdened by your blogging right now, Lena :( When I feel I have nothing to share, I try not to get overwhelmed by it or count the days/weeks as they go by. It is easier for me, perhaps, as I am just writing about things I create, and I use challenges put on by others to inspire me. I use my hobby to relax, and blogging became a natural extension as well as a way to express myself in writing. Please don't let this little pause discourage you from the blogging world. Allow yourself time to deal with the difficulties you are facing: life will have its sunshine AND its shadows, as you well know, so ease up on yourself right now :) Doctor's orders! I love your projects, uplifting quotes, updates on your garden and your happy pictures! But it's all right to take a break too. And Women's Conference is this week - come on down to BYU for an afternoon - that's a nice little get-away. That's a good idea! I love to share inspirational quotes. As an aside, I used to have your blog under a bookmark subheading I named Blogs I like. I now have a new subheading called Lena and it includes your blog and all the other lovely blogs I found through the comments here. I would say you improved my early mornings exponentially. Well, I'm glad :) There are some really awesome people here, and I feel honored to know them. So scary! Hope all will be well. Thank you, Cherish! She's doing much better now. I know how you feel. I've gone through times where real life has just been to chaotic to blog, and times when I have nothing to say, and times when I hate blogging. But then there are other times where I'm on a roll, my mind is full of ideas and I love writing! As someone above said, life ebbs and flows. You'll find your way again I'm sure! Keep doing what you do here because it's great! And hope life will be a little smoother for you in the coming weeks.